Since their inception a few years ago, the Belmont Derby and Belmont Oaks have quickly become two of the most interesting stakes to handicap on the entire NYRA calendar. American three-year-olds converge from all over the country to sort out who are the leaders of the sophomore turf divisions. Unlike their counterparts in the Triple Crown series, the elite American three-year-old turfers do not get a chance to shine in a series of Grade 1 prep races. Rather, they all have to take unique, less glamorous paths to this one major moment in the spotlight. However, even once they pass the entry box, their tasks are complicated by the annual influx of European runners, including many that bring formidable credentials. This year is no different. The Grade 1, $1,250,000 Belmont Derby Invitational drew a full field of 13, composed of 10 American runners and three European shippers. The American contingent is led by a quartet of runners exiting the local prep race, the Pennine Ridge, while the European shippers are headed by a pair of well-regarded Aiden O’Brien trainees. 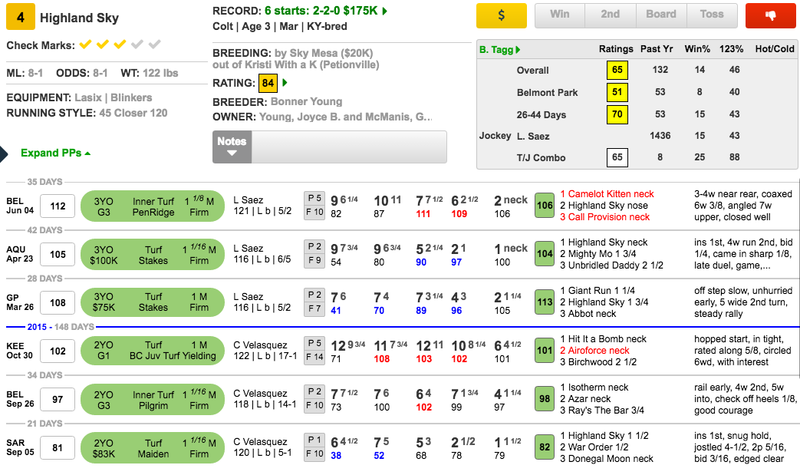 The Pace Projector—which takes into account only those with American form—predicts that the two runners exiting the Penn Mile, Airoforce (#8) and Beach Patrol (#9), will be placed on or near the lead early. Also likely to play a part in the early pace is Toughest ‘Ombre (#1), who was the runaway leader through the opening furlongs of the Pennine Ridge. Let’s start with that aforementioned local prep race. The winner that day was Camelot Kitten (#6), who worked out his second straight excellent trip under Irad Ortiz. He was able to save ground during the early portion of the race and had to angle off the inside only midway around the far turn. His stablemate, Call Provision (#12), had a mildly more difficult trip, racing just outside his stablemate for much of the running, but the horse that was really hindered was Highland Sky. The fact that Highland Sky (#4) has finished no worse than second in his last three races, considering the trips that he’s gotten, is pretty remarkable. Three back, he had to make a four-wide move around the far turn while closing into a slow pace (color-coded in blue). Then it was the same story two back at Aqueduct, when he was able to get the better of lesser foes after another wide trip. However, his last race really takes the cake. For whatever reason, Luis Saez seemed totally unconcerned about saving any ground. He angled Highland Sky five-wide at the start of the far turn, and was carried out farther by the time they completed that bend and hit the top of the stretch. He lost a ton of ground and put in a spectacular effort to be beaten only a neck for the win. This horse is bred to love extra distance, hailing from a stamina-laden female family, and we believe that he’s a major threat to the European challengers. The two Europeans likely to attract the most support are the pair going out for the familiar Aiden O’Brien barn. Deauville (#13) brings the stronger overall form, having finished a close second in the Royal Lodge as a two-year-old. He was then runner-up in his three-year-old debut in the Group 2 Dante Stakes, considered one of the major preps for the Epsom Derby. 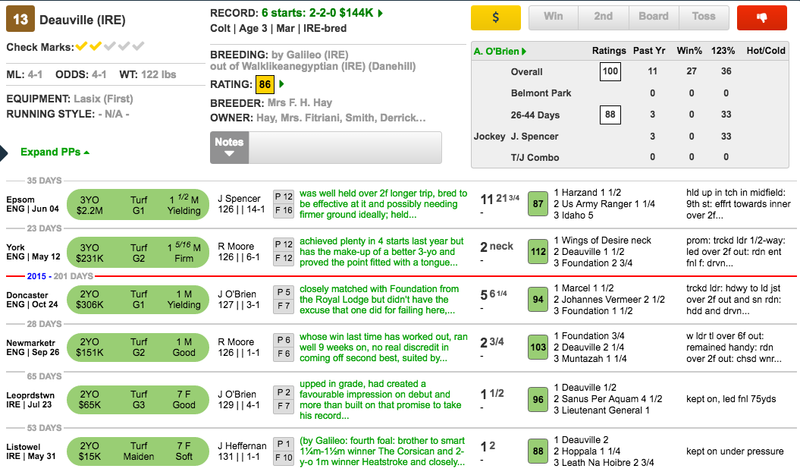 Our Timeform foreign correspondents indicate that he ran “to a level that makes him about the pick of his stable’s obvious Derby contenders.” Obviously, that plan did not work out as he failed to show up with anything close to his best at Epsom. This race is probably somewhat of a consolation prize, but he does have the form at this distance to fall back on. It’s a tough post position, but he’s one worth considering. His stablemate, Long Island Sound (#7), debuted in April, but has been coming on strongly since then. He reeled off three consecutive victories in lesser races to start his career, and then stepped up nicely in the Group 3 Tercentenary Stakes, finishing third behind Hawkbill. That runner would come back to win the Group 1 Coral Eclipse in his next start, which certainly flatters the form of this improving son of War Front. A mile and a quarter seems to be within his scope. American racing fans will be familiar with his pedigree, since his dam is a half-sister to the almighty Zenyatta. Finally, Humphrey Bogart (#10) gets sent over by Richard Hannon after two consecutive attempts against some of the best three-year-olds in England. His Investec Derby effort at Epsom was hardly disgraceful, even though he couldn’t stay with the leaders through the final quarter mile. He then was a mild disappointment when sixth at Royal Ascot, but still gave a decent account of himself. Our Timeform foreign correspondents indicate that he was “lacking pace once again,” and “may be ready for a step up in trip.” However, he gets the opposite today as they instead elect to turn him back in distance. He’s not our pick of the European contingent, but he’s far from out of this. Airoforce (#8) and Beach Patrol (#9) both will attempt to stretch their speed the ten furlongs as they exit the Grade 3 Penn Mile, in which they both finished behind the filly, Catch a Glimpse. That one’s stablemate, Airoforce, got the much better trip that day. After he set the pace and faded in the American Turf, they decided to instead try rating tactics at Penn National, and he responded well, coming with a strong stretch rally after saving ground around the turns. Beach Patrol, on the other hand, had benefited from more aggressive tactics in his prior starts, so it’s somewhat puzzling that he was taken so far off the pace in the Penn Mile. Joel Rosario was then playing catch-up throughout in a slow-paced (color-coded in blue) race. We’re not sure that he really wants a mile and a quarter, but we’re certain he’s better than the most recent effort. After all, Giant Run came back to win a stakes here last weekend, bolstering the apparent quality of the Penn Mile. In our opinion, the others are up against it here. Ralis (#2) has obviously improved since switching to turf, but we’re a little skeptical of the quality of those California turf stakes in spite of their high overall ratings. Surgical Strike made a decent late run in the American Turf after getting a fast pace (color-coded in red) to close into. However, he’s yet to run speed figures that suggest he can hit the board in a spot this tough. Aquaphobia (#11) is improving quickly, but faces a daunting rise in class after beating a couple of lesser stakes fields at Pimlico and Delaware. Highland Sky (#4) is our pick in the Belmont Derby, but we will also use all three European runners prominently, in both exactas and trifectas.